The Korean-based electronic giant, Samsung, has made a breakthrough and created a new milestone in the video and audio recording industry by introducing its latest H-Series HD digital camcorders that feature internal SSD or solid state drives. This new H-Series offers four new models namely HMX-H106, HMX-H105, HMX-H104, and HMX-H100. The H106 model incorporates a 64GB SSD to provide onboard memory whereas the H105 and H104 come with 32GB and 16GB SSD respectively. The H100 does not offer any internal SSD and it requires the use of a SD/SDHC memory card. The SSD or solid state drives are more frequently used in laptops especially in Lenovo ThinkPad as well as Apple MacBook Air. This flash-based storage solution is more durable and consumes less power compared to those conventional hard disk drives (HDD). By applying this technology into a digital camcorder, Samsung manages to improve the camcorder’s performance and enhance its reliability. Less power consumption will prolong the recording time before the next charging and reduce heat emission as well. With SDD technology, the boot-up and data reading/writing speed has also increased tremendously. Besides the SSD craze, the H-Series HD digital camcorders also come with the world famous Schneider optics. They are incorporated with Schneider Kreuznach Varioplan HD lens featuring a 10x optical zoom and apply Samsung’s Optical Image Stabilization technology. This stabilization feature can reduce the blur found in footage due to vibration or hand shaking. Other interesting functions available in this H-series include the utilization of H.264 compression which can prolong recording time and offer high resolution video and image quality. 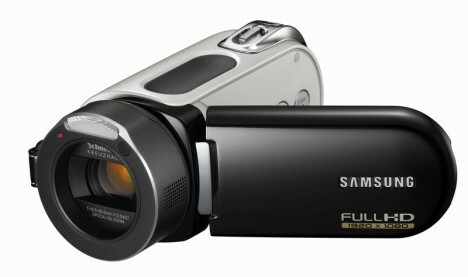 The Samsung H-Series also offers video enthusiasts a new HD Time Lapse in recording mode. Video enthusiasts can make use of this Time Lapse recording mode to record a single image at an interval pre-selected by them, at 1, 3, 5, 10, 15, or 30 seconds, and save each image as one single movie file.